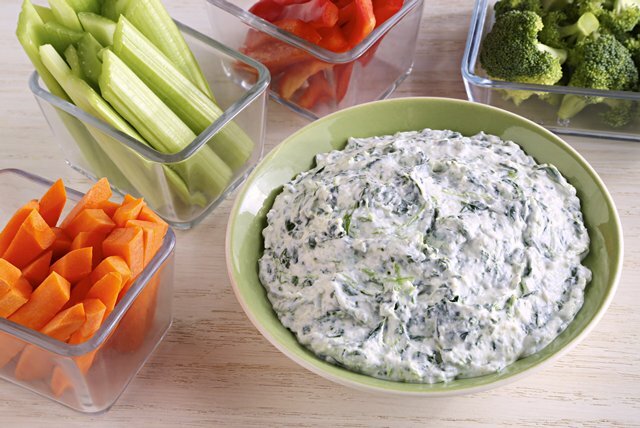 Here's a creamy spinach dip for the garlic lovers—and if you don't have garlic on hand, no worries; you can use garlic powder. Refrigerate at least 3 hours or up to 3 days. Save 30 calories and 4.5 g of fat, including 1 g sat fat by preparing with KRAFT Light Mayo Reduced Fat Mayonnaise and BREAKSTONE'S Reduced Fat or KNUDSEN Light Sour Cream. Serve dip in large hollowed-out green or red pepper or head of red cabbage.